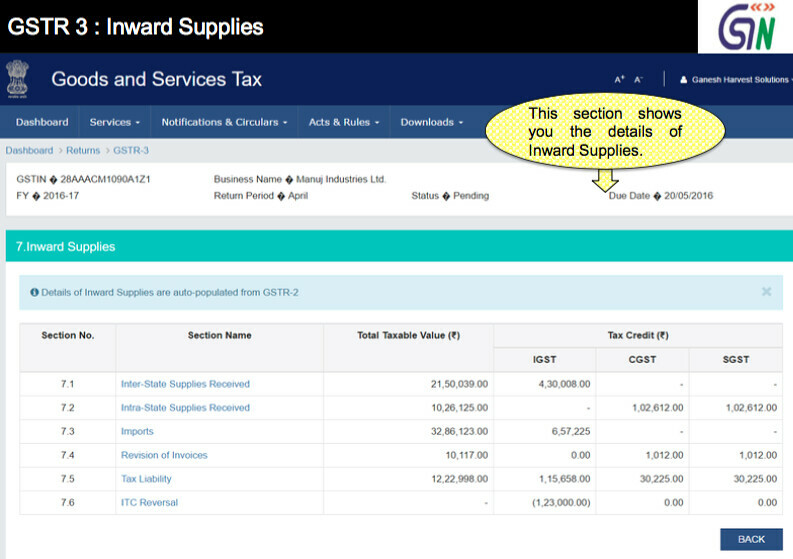 How to File GSTR 3, Guide on Filing GSTR-3 on GST Portal: Every registered business is required to furnish details of Inward and Outward Supply and make payment of GST in monthly GSTR-3 Return. Check online Procedure for Filing GST Monthly Return at GST Portal: After finalizing the statements for outward and inward supplies, a registered taxable person has to file the monthly return in Form GSTR-3. We discussed earlier various heads under GSTR-1 and GSTR-2. GSTR-1 requires to furnish details of outward supplies of taxable goods and services by registered taxable supplier. Similarly, GSTR-2 mandates furnishing details of inward supply or purchases in simple words. Here we are discussing various heads and their information source under GSTR-3. The return in GSTR-3 is auto populated from Forms GSTR-1 and GSTR-2. Further, the details of tax, interest and penalty paid have to be reported in Part B of Form GSTR-3. The return has to be filed by 20th of the succeeding tax period. GSTIN: GST Number (GSTIN) is a unique 15 digit number which is allotted to the assessee at the time of filing an application for registration for Goods & Service Tax. Each taxpayer will be allotted a state-wise PAN-based 15-digit Goods and Services Taxpayer Identification Number (GSTIN). Just like PAN Card No is required for payment and filing of Income Tax Returns, similarly GSTIN is required for payment and filing of GST Returns.. The GSTIN of the taxpayer will be auto-populated at the time of return filing. Address – Business address of the registered taxable person will get auto-populated here. Period: (Month -Year) – A Taxable person is required to select from a drop down the relevant month and year respectively for which GSTR-3 is being filed. 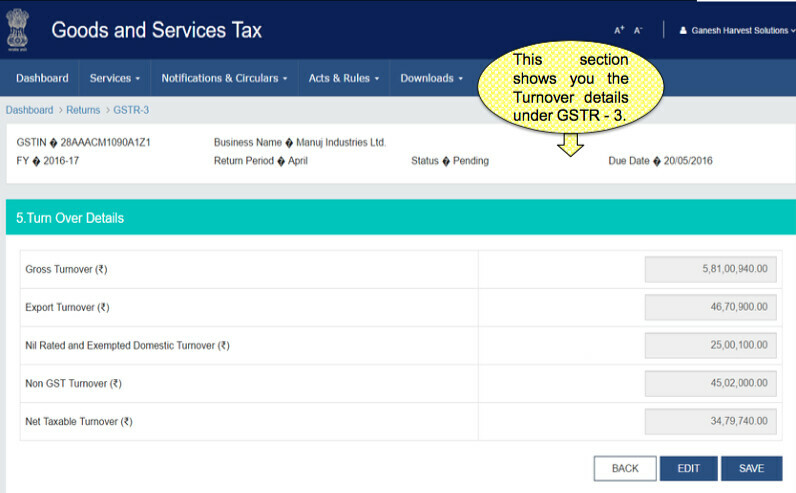 Step 3 : Now click on “Service Menu” and then click on Returns and then click on GSTR 2 – Now you will reach at GST Returns Page This section shows all the services available on the GST portal. You can select one to proceed further. Here below you may find detailed process for how to file GSTR 3 Return, find complete details for GST Return process at GST Portal with screenshots. Now check more details from below…. GSTR 3 : Total Tax Liability – This section shows you the details of Total Tax Liability for the Month. 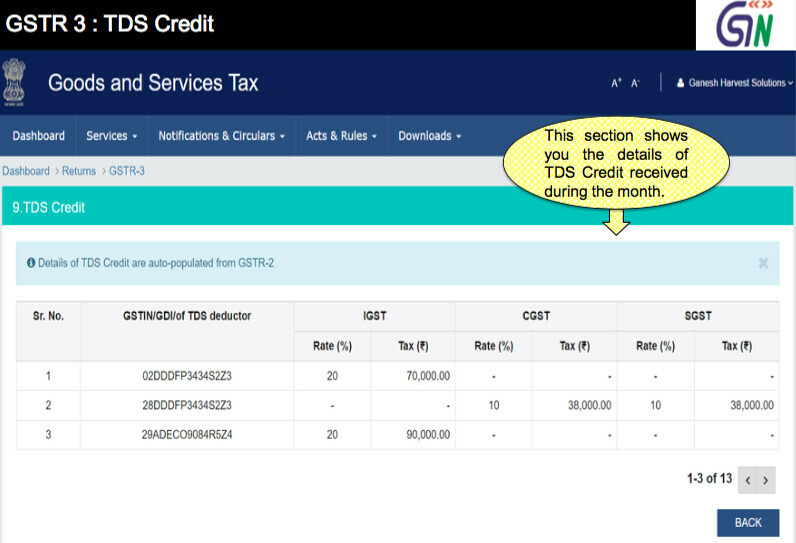 GSTR 3 : TDS Credit – This section shows you the details of TDS Credit received during the month. GSTR 3 : ITC Credit – This section shows you the details of ITC Credit received during the month. 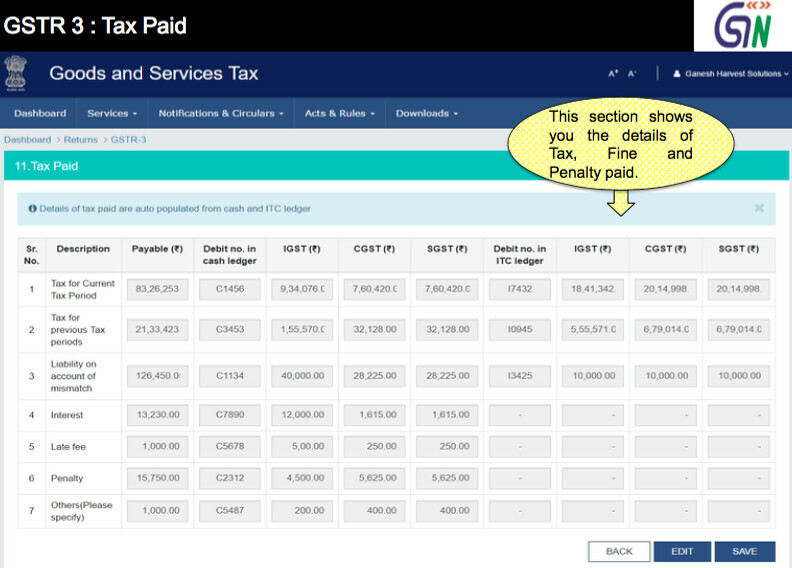 GSTR 3 : Tax Paid – This section shows you the details of Tax, Fine and Penalty paid. GSTR 3 : Refund Claim – This section shows you Refund claims of excess ITC in specified cases and refund / adjustment of excess paid earlier. Tax, Interest, Late Fee and Penalty Paid – This heading will take input from all the headings from Part A and will determine the final GST liability. Separate tax liability will be shown against CGST, SGST, and IGST. Here the taxpayer will have the option to debit cash ledger/ credit ledger against the liability outstanding. Refunds Claimed from Cash Ledger – Input Credit amount in excess of tax liability will flow to this heading. The taxpayer can claim a refund of amount showing in this header.